The music was fantastic, the kids, well Lulu was great but the other were struggling to get over colds and coughs and like anyone, they did not appreciate the cold, windy weather. I ended up taking Zelda home early. A baby with a wet cough and minus temperatures in a tent do not mix well. We were so thankful for our friends that came with us who are experienced campers. They made it so much more easy for us to handle Zelda while they started the food prep in the morning. Bananas and chocolate cooked in the fire for breaky?! Yes please! 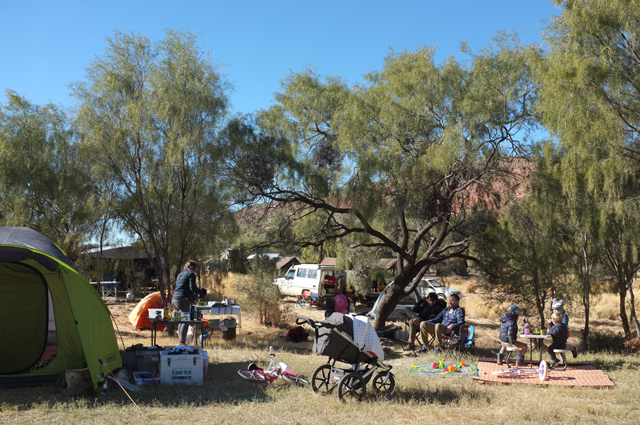 The Top Half Folk Festival is held every two years at Glen Helen Resort You can fly to Alice Springs, hire a camper van, drive out along the beautiful West Macs and take part in 2019! Your camper will be a lot warmer than our tent - guaranteed!